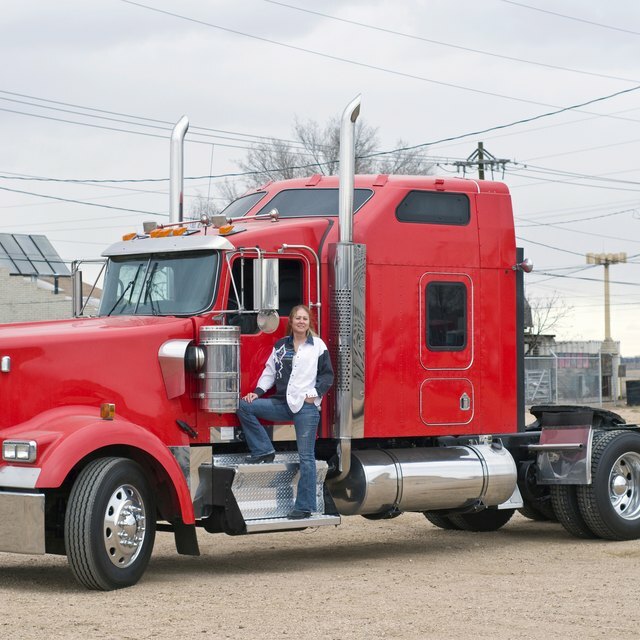 The Internal Revenue Service allows truck drivers to deduct expenses related to their business. If you are self-employed, list these deductions on Schedule C along with your business income. If you work for a company, report these expenses with your itemized household deductions on Schedule A, such as mortgage interest, charitable contributions and property taxes. If your employer reimburses you for an expense, you cannot claim it as a deduction. Even if you drive a company-owned truck, you can deduct any vehicle repair and maintenance expenses you paid out of your own pocket. You can also deduct equipment and accessories necessary to perform your job safely, such as chains, tarps or tie-down straps. Refrigerators, bedding, televisions, coffee makers and other interior furnishing items are also deductible if you drive long routes and are expected to spend the night in your truck. Since you work on the road, you can also deduct money paid for office supplies kept in your truck, such as paper clips, pens and envelopes. If you are required to pay for copying and faxing paperwork to your employer, you can deduct these fees. Grooming supplies, toiletries and shower fees are deductible while you are on the road. Uniforms and laundry expenses are deductible as long as you cannot also wear the clothing casually outside of work. If you are required to pay membership dues to a union or other trade association, you can deduct these expenses. These dues are deductible whether you pay out-of-pocket or your employer withholds the money from your paycheck. Subscriptions to trade magazines are deductible if they are directly related to your business. You cannot deduct subscriptions purchased for entertainment purposes, such as a sports magazine to read at the truck stop. Can I Claim My Nursing Uniforms on My Taxes? You can deduct the cost of a hotel room and 50 percent of your meals and tips when you are required to spend a night away from home. You can also choose to simplify your recordkeeping by choosing the standard per diem rate instead of itemizing your actual dining charges and tips. The per diem rate varies by location and is adjusted periodically to keep up with cost of living increases. You must keep all receipts or logs related to your deductions in case the IRS needs them for an audit. For a standard tax return, the audit period is three years after the filing date. If you filed an amended return for a prior year because you did not report taxable income over 25 percent of your gross income, you must keep your records for six years after the filing date. You must keep your records indefinitely for any year in which you failed to file a return or filed a fraudulent return.